Subsurface RCF exposed by rail grinding. Image courtesy of Brad Kerchof. Rolling Contact Fatigue (RCF) is an issue every railroad, and many transit systems, around the world must contend with. Despite its ubiquity, RCF is not perfectly understood. There are many researchers, railroad operators and suppliers, experts in their field, working to understand and eliminate RCF and its attendant damage mechanisms. The International Collaborative Research Initiative (ICRI) was founded in 2014 to bring together these disparate sources of expertise in order to facilitate a collaborative approach to addressing RCF and wear. 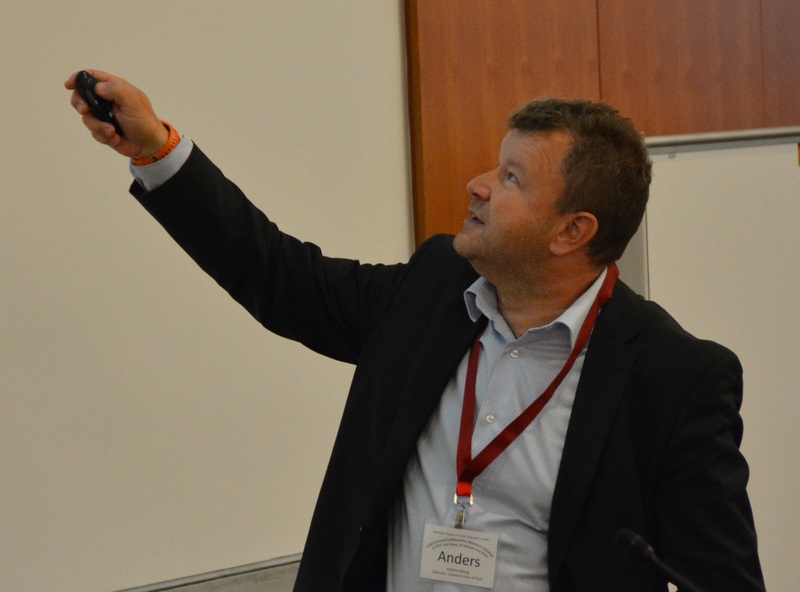 Following several smaller meetings in North America and the European Union, the first ICRI Workshop took place in August 2016 in Vancouver, BC and brought many of the collaborators together for a series of presentations and discussions that enabled participants to comment on the various research projects underway, and their own successes and challenges in addressing RCF and wear from the macro- to the microscopic level. Mike Roney, Principal of Iron Moustache Consulting. Derailments, whether RCF-related or not, are the worst-case scenario for any railroad. Derailments affect the bottom line, public perception, regulation. The good news is that the number of derailments continues to fall. “There are fewer derailments now on US Class 1 Railroads (per million train miles), than ever before,” said Mike Roney, Principle of Iron Moustache Consulting. There are many reasons for this, but one of the biggest factors, he said, is the Class 1s’ commitment to rail grinding. The tightening of ultrasonic inspection intervals has also contributed to the drop. But while derailments are down, news travels fast and political ramifications are ever-present. That means it’s critical that railroads continue to improve upon the positive trends in rail maintenance, like preventive grinding, he said. It’s also important to improve efficiency for the sake of driving down costs – rail grinding alone represents a cost of about $200 million per year on Class 1 railways. Gary Wolf, President of Wolf Railway Consulting LLC, noted that the cost of rail grinding, which may seem high, has to be considered against other costs – first, the net benefit to systemic maintenance cost and rail life improvement, and second, the cost of a potentially catastrophic derailment. “A multi-million dollar hazardous materials derailment can pay for a lot of rail grinding,” he said. Rail maintenance can generally be broken down into two regimes based on the dominant damage mechanism: wear-based and stress-based, Roney said. Wear-based regimes are more predictable, and largely controllable with friction management. “But a stress-based regime is a different world. In that case, RCF is the dominant mechanism,” he said. RCF is more difficult to manage, but it can be managed with a disciplined rail grinding program. And although RCF development is more difficult to trend than wear rates, it can be done fairly accurately with targeted statistical analyses, Roney said. CSX Transportation is now in the process of developing one such practical application, and is currently in the early stages of developing a condition-based predictive grinding program. Tentative Surface Quality Index (SQI) ranking system. Image courtesy of Daniel Hampton. The first step of the program is to develop an industry-standardized Surface Quality Index (SQI). KLD Labs and the National Research Council (NRC) have proposed an index assigns ranks from 0 – 7 based on the severity of RCF and related surface damage (0 indicates no damage, while 7 indicates significant shelling and spalling with defects of greater than 16mm in diameter or 20mm in length). The program will then determine the average timeline for progression from category to category, said Daniel Hampton, Manager of Contract Services at CSX Transportation. “In order to make the scoring system applicable industry-wide, a lot of disparate data sets have to be converted to a common scale,” Hampton said. The first and most difficult part of developing a common reference is to collect, correlate and align surface quality and RCF data from multiple instruments and suppliers. 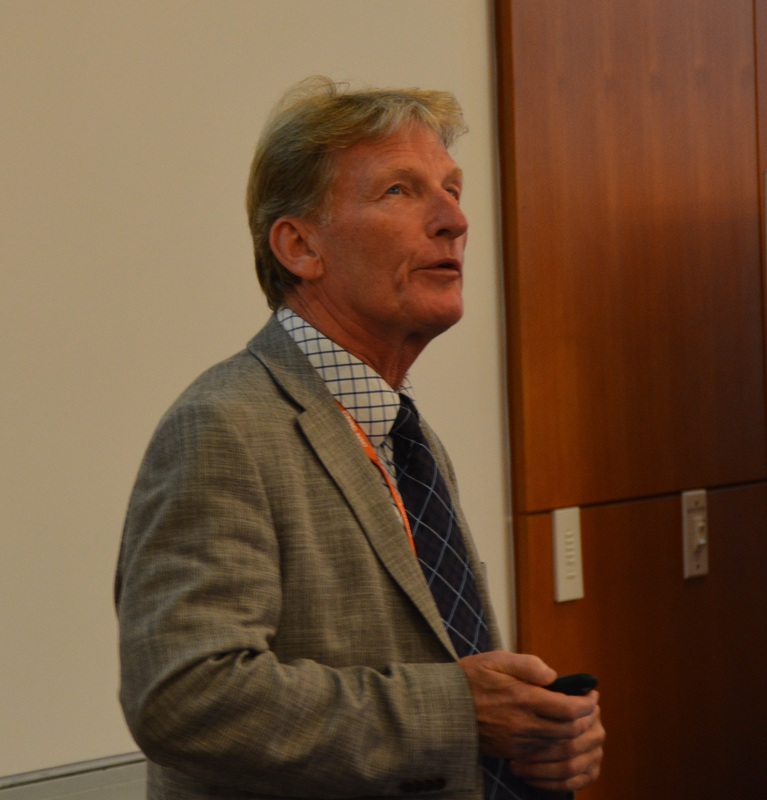 “As an industry, we’re very good at measuring profile and wear; quantifying RCF and surface condition with the same accuracy is probably where we need to go next,” said Bob Tuzik, Rangecam Business Manager at Holland LP, Publisher of Interface Journal, and a moderator at the workshop. Part of the difficulty of developing a standardized surface quality index is due to the fact that different rail surface measurement systems (such as eddy current, magnetic induction, machine vision) measure different aspects of rail surface and near surface condition. In addition, RCF-measurement systems are generally still in the early phases of validation and deployment. As the project progresses, CSX will develop a baseline for data alignment by gathering eddy current data from CSX’s thousand-mile continuous test loop. “We’ll collect a lot of data over a range of curvature and tonnages,” Hampton said. Once the project has concluded, CSX plans to use the SQI ranking and projected degradation rates to better inform its grinding program. Wolfgang Scheoch, Director of External Affairs, Speno International SA. While an effective preventive grinding regime is an ideal target, it’s also important to employ corrective grinding when the situation calls for it. “By focusing too much on maintaining a preventive grinding mode, you can miss deeper defects,” said Wolfgang Scheoch, Director of External Affairs, Speno International SA. Preventive grinding, which typically results in very little surface material removal, only works if the rail is in a defect-free state. But defects can be missed, they can be larger than expected, develop faster than expected, and can change position over time, Schoech said. One good example of this, is a recent aggressive grinding study on Norfolk Southern in which a number of grinding passes on an apparently clean rail section uncovered both significant RCF and a nearly 0.21 inch deep spall, said Brad Kerchof, Director of Research and Tests at Norfolk Southern. 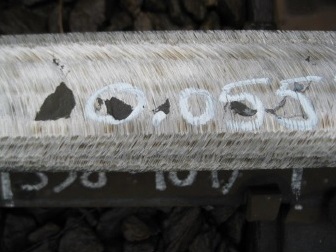 Further complicating the matter was the fact that the defect was effectively invisible to ultrasonic testing due to interference from RCF at or near the rail surface. “There might be a lot of RCF out there that’s invisible until you begin to grind,” Kerchof said. And that RCF could be effectively concealing even bigger issues. The take away? 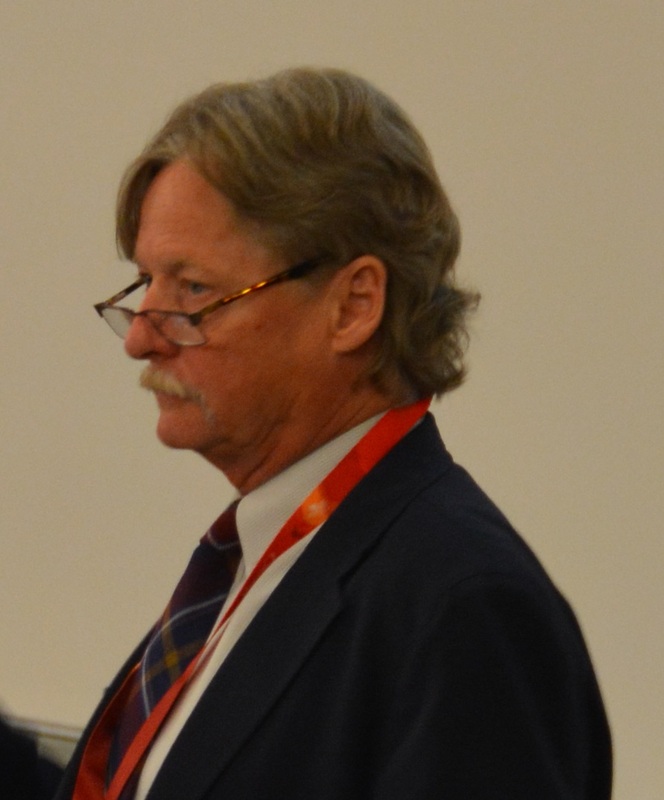 “Your grind plan has to include RCF removal where it impacts rail testing,” he said. Subsurface spalls opened-up after 11 grinding grinding passes. The deepest spall measures a total defect depth of 0.21 inches. Image courtesy of Brad Kerchof. In addition to revealing hidden defects, rail grinding can, if it doesn’t completely remove a crack, change the point on rail where surface cracks are exposed. And this can dramatically change the crack growth mode and rate, Schoech said. Eric Magel, Principal Researcher at the National Research Council Canada and organizer of the ICRI Workshop, added that if a crack is not completely removed through rail grinding, the remaining cracks should at least grow at a slower rate. Theoretically, by removing the laterally-inclined surface layer of the crack and thus shifting it to a more vertical orientation, the crack will propagate slower. But, Magel added, that theory hasn’t been extensively modelled. 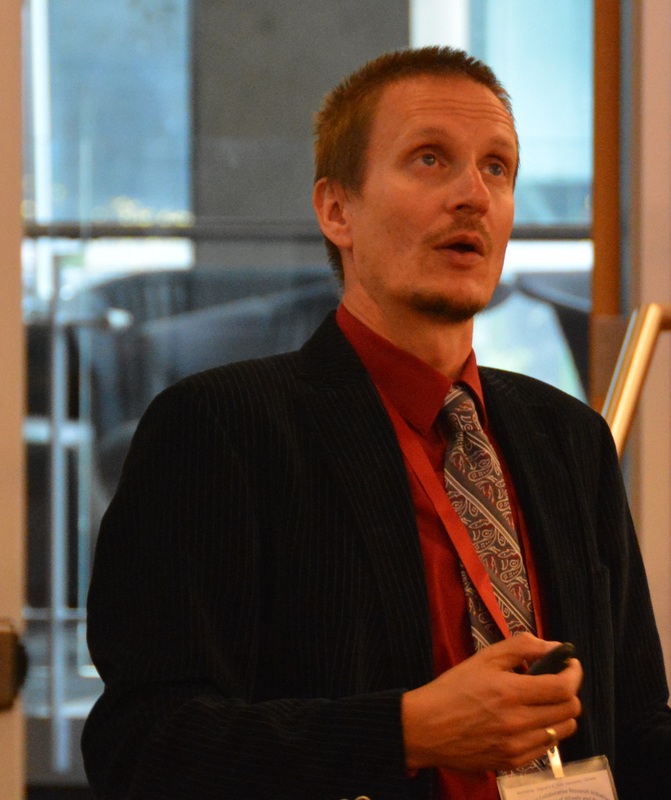 Eric Magel, Principal Researcher at the National Research Council Canada and organizer of the ICRI Workshop. Like other aspects of managing RCF, rail grinding is a balancing act. 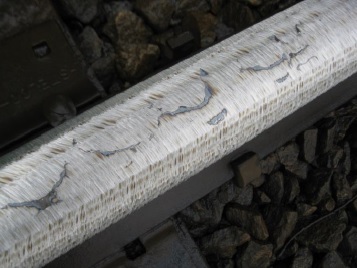 It’s important to avoid incomplete corrective grinding and partial removal of defects, but it’s also important to minimize metal removal for the sake of maximizing rail life, Shoech said, “which leads to the question of how important it is to remove all residual cracks during a grind cycle,” he added. It’s a question that many in the industry, and some of the ICRI attendees are actively exploring. Aside from aggressive grinding, another option for removing deep surface cracks is rail milling. The Deutsche Bahn, for example has a metric for determining when and where to use rail milling versus grinding based on crack depth and required material removal, said Joerg Radanitsch, Head of Business Development at LINMAG GmbH. Milling also differs from grinding in terms of RCF remediation in that milling is purely a corrective maintenance action and is not typically performed cyclically, Radanitsch said. Milling is often characterized as a last step before rail replacement, due to the ability to remove large amounts of material and drastically reshape the rail. In terms of the reduction in rail life and economics of milling and aggressive grinding, Brad Kerchof added that it’s still less costly than replacing the rail. Friction management is another one of the primary tools used to address RCF and wear. Aside from well documented reduction in forces that contribute to RCF, friction management (particularly top of rail (TOR), in this case) can also have a positive effect on rail grinding regimes. Studies at the Transportation Technology Center Inc. (TTCI), for example, have shown that the addition of a TOR friction modifier can significantly extend the MGT interval between grinding cycles required to maintain a magic-wear-type preventive grinding program, said Richard Stock, Rail Technology Manager at L.B. Foster. Richard Stock, Rail Technology Manager at L.B. Foster. A recent study on the UK’s Network Rail has also shown the efficacy of TOR in reducing wear on special trackwork. In this case, the friction modifier was applied to control abnormally high wear at switch points and switch rail at Network Rail’s Nuneaton Junction (see WRI EU Part 1 for more information). The pilot program was so successful in terms of wear reduction and switch life improvement (a 7.5x increase in weld-repair interval) that wayside application units are now being installed at a number of high-wear switches on the test line and throughout the system, Stock said. Temperatures in such tests tend to be very high due to the high number of test cycles and small surface area of the test specimens. The application rate and amount of the third-body-layer material (the water/oil/friction modifier) at the contact patch tends to be much higher than is found in the operating environment. Twin-disk contact geometry is not the same as operation contact geometry. Scaled tests are often not run long enough to reach a steady state of wear. Scaled tests often do not address widely varying ambient humidity and temperature. 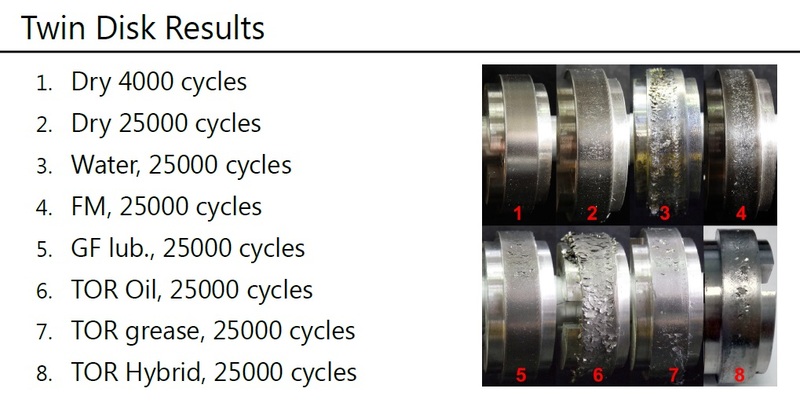 Sample twin-disk test results showing the effect of various third-body layer materials on surface condition. Image courtesy of Richard Stock. These considerations aside, scaled testing is nonetheless an important part of fully exploring many aspects of contact mechanics and RCF generation. In addition, several recent twin disc studies have taken many of these potential issues into account when designing laboratory studies, Richard Stock noted. The University of Sheffield, in partnership with LB Foster, is in the process of studying friction modifier characteristics using a high-torsion test rig. This kind of testing is not representative of the rolling and sliding contact dynamics of the operating environment, but it provides very controlled assessment of frictional behavior of the third-body layer, said Martin Evans, PhD Candidate at the University of Sheffield. The test is focused primarily on quantifying the friction characteristics of various materials at various application levels. “Now we can take information from small scale tests like these and plug it into other, larger models,” Richard Stock added. Field testing presents a more complex, representative picture of the operating environment, but it also introduces a tremendous number of variables that can’t be controlled as precisely as in a scaled test, said Anders Ekberg, Professor of Solid Mechanics at the Chalmers University of Technology. Field measurement of rail tribometry, for example, rarely includes the friction characteristics of the wheel or any of the third-body material present at the interface; “Even the best tribometer is only getting a half image of operating conditions,” he said. Differences in test scale and variable control are in some ways analogous to differences between simulation data and test data – each method of data collection has its own strengths and limitations – but the real strength is in comparing multiple data sets from multiple test rigs and environments, he said. “[In the case of twin-disk studies] we are not looking at real world operations, but they do show that water has a profound effect on crack growth, and that’s important to explore,” Don Eadie said. Full scale test rig studies that more accurately represent operating conditions generally echo the findings of twin-disk studies, in principle if not severity, he said, “although the role of liquids in crack propagation remains drastically under-researched,” he added. Another related aspect of crack growth that requires additional research, Ekberg said, is the role of friction between crack faces. A number of ICRI participants indicated that this area of research presents a good opportunity for ICRI exploration and contribution, going forward. Grinding and friction management are a major part of current RCF remediation practices, but they are not the only techniques in use. Neither is RCF an issue limited to the rail. Wheels are also subject to wear and RCF, and must be factored in to a holistic and systemic understanding of RCF. Part 2 of our coverage of the ICRI Workshop will look at these and other topics that ICRI participants explored and discussed. For more information on the ICRI and ICRI Workshop, visit IRCI-RCF.org.